We’d love your help. 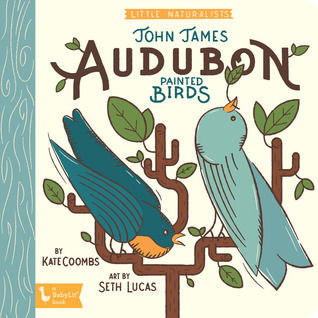 Let us know what’s wrong with this preview of John James Audubon Painted Birds by Kate Coombs. Introduce your baby to the stunning artwork of famous naturalist John James Audubon. John James Audubon was an ornithologist, naturalist, and painter. He is known for his stunning illustrations and paintings of North American birds in their natural habitats, painting over 700 species discovering 25 new kinds of birds during his lifetime. John James Audubon Painted Birds sha Introduce your baby to the stunning artwork of famous naturalist John James Audubon. John James Audubon was an ornithologist, naturalist, and painter. He is known for his stunning illustrations and paintings of North American birds in their natural habitats, painting over 700 species discovering 25 new kinds of birds during his lifetime. John James Audubon Painted Birds shares his legacy and his love of nature with budding bird-watchers through a clever poem and gorgeous illustrations. As Audubon said, "the world is not given by [our] fathers, but borrowed from [our] children." To ask other readers questions about John James Audubon Painted Birds, please sign up. Wonderful introduction to Audubon for small children. I was born in Spokane, Washington, but I spent most of my childhood in Camarillo, California, which is about an hour's drive north of Los Angeles. Whenever possible as a child, I read books—books, books, and more books. The rest of the time I rode my bike with my sister, Loni, or looked after my little brother and sister. Sometimes we went to the movies at an old theater we called "The Sticky Thea I was born in Spokane, Washington, but I spent most of my childhood in Camarillo, California, which is about an hour's drive north of Los Angeles. Whenever possible as a child, I read books—books, books, and more books. The rest of the time I rode my bike with my sister, Loni, or looked after my little brother and sister. Sometimes we went to the movies at an old theater we called "The Sticky Theater" because there was always soda spilled on the floor. I was already a fan of fairy tales and comedy, so it shouldn't surprise you to hear that my favorite movie when I was a child was Snow White and the Three Stooges. I began writing stories, poems, and plays in grade school. For the plays, I would write myself parts like The Glorious Queen and my sister parts like The Quiet Servant Girl. She was a pretty good sport about it! When I was a teenager, I played bells in the marching band and oboe in the concert band. For a while I wanted to be a concert oboist. I even learned to cut and tie my own double reeds, a tricky task. Next I dreamed of becoming an artist. But once I got to college and started studying art, my first love—books—came back and grabbed me, so I ended up majoring in English. I eventually worked as a college writing teacher, an editor of coffee table books and technical manuals, and a grade school teacher. I later worked as a home teacher, driving around Los Angeles to teach seriously ill students. I've been teaching on and off for years, instructing students in every single grade from K-13, kindergarten to college! While I was teaching, I was also writing stories in my free time. I wrote a lot of stories, which gave me practice and helped me become a better writer. After a while I started sending my stories to publishers, asking to have them made into books for kids. It took a long time, but eventually my dreams came true—now I'm a published writer! My dad used to call me Kate the Great. I was once attacked by a monkey. When I see a dry leaf on the sidewalk, I go out of my way to step on it and hear the crunch. I have six brothers and sisters. We're all adopted and from four different ethnic backgrounds. I can flicker my nostrils really well. My favorite color is the blue-green at the top of an ocean wave when it catches the light just before it falls.